Regiment. Royal Garrison Artillery. No. 55639 Despatch Rider. ​Served in France and awarded a medal. Baptised 12th July1896. Parents; William (Nursery Labourer) and Rhoda Anderson. In 1891 they lived at Dodoak or possibly Wulstans Lodge, Hillhampton, Worcs. Regiment. Royal Field Artillery. Served in France. Parents, William (Labourer 1899, Sawyer 1907) and Rosanna Barker. In 1901 they lived in Cart House and 1911 in Church Cottage. Regiment, French Army. ​Francis Belaribi, of Bartlands, a French subject and naturalized Englishman, who joined the French Army early in 1915. His linguistic powers were at once recognized, and he was appointed an Interpreter, his duties entailing exposure to enemy gun fire and bad weather. Mr. Belaribi contracted a serious illness from which, after several operations, he died at Hauteville, France, on August 12th. R.I.P. Mr and Mrs Belaribi lived at Bartlands before the first World War, They were quite involved with village life and Mrs Belaribi was patron of the Girls Friendly Society. She left Shrawley sometime after June 1922 and believed to have moved to Brighton where she died on February 23rd 1925. Regiment. RMLI (h). MS Warspite - Jutland Battle. aged 30. Boulogne Eastern Cemetery Ref III.C.53. Wife, Clara Brooks of 12 Christchurch Road, Reading. Parents, Joseph and Sarah Brooks, of Hatfield Hyde, Herts. Regiment. 10th Worcesters. Private Served in France/Galipoli, wounded once. In 18?? they lived in Woodbine Cottages??. Regiment. 1/8 Worcesters, Private Served in France, wounded once. Parents, John (blacksmith) and Ann Cocum. In 1901 they lived at the Green (Sankyns Green). Regiment. RGA, Gunner, Served in France, wounded once. In 1901 he and his mother boarded at 2 The Green with James Knowles, farmer. Parents, Frederick Samuel (farmer) and Fanny Ford. Lived 1911 at Caldicotts farm. The Rev J Brien Frith came to Shrawley in 1911 and left in March/April 1919. During this time he and his wife had 2 sons (twins) and a daughter. In March 1916 he went as a Chaplin to the forces and arrived in France in April and a week or two later, contracted Measles and was sent on a home visit to Shrawley in July. After a brief recuperation he returned to France where he remained until March 1918 when he was released by the Chaplin General and returned to Shrawley in April 1918. They did not stay there long and 1920 moved to St Mary’s Church, Swynnerton, Staffordshire taking over as Rector from his father. He held the position of Rec until tor 1942 and on retirement moved to Hayling Island. His twin sons, both of whom were killed in World War 2 - Major John Brereton Frith M.C., Royal Artillery died of wounds in Burma on 10th April 1945 and is buried in the British Military Cemetery at Taukkyan,Mandalay, Grave/Ref 27.B.14. His brother Capt. Robert Brereton Frith M.C., of The Worcestershire Regt, killed in action on 17th November 1941 and buried in The British Military Cemetery at Keren, Eritrea, West Africa, Grave/Ref 4.A.3. The death of his sons took its toll on him mentally and he was nursed by his wife for many years before he passed away. He is buried in the family grave at Swynnerton. There is a stained glass window in Swynnerton Church in memory of the two sons. Remembered on the Thiepval Memorial and St. Mary’s Church, Shrawley. William Godridge Pandfield, the eldest son of Wyndham and Betsy (Bessie) Pandfield was born 1880 (June Q.) in Southampton1. In the 1891 census the Pandfield family are residing in the village of Ombersley, Worcestershire, William aged 11 together with his parents and 3 other siblings, Florence aged 13, Wyndham S. aged 4 and the youngest brother Salisbury aged under 9 months 2. William enlisted in the Worcestershire Regiment in March 1900 3 In March 1901 William a Private was serving in the 4th Battalion stationed at Ramillies Barracks, North Camp, Aldershot, Hampshire, his age is given as 21 4. Later in the year he served as a Corporal with the Worcestershire Company, 17th Mounted Infantry in South Africa and was awarded the Queens South Africa Medal with clasps for Cape Colony, Orange Free State, Transvaal, South Africa 1901 and South Africa 1902 5. By the time of the 1911 census he is a Sergeant serving overseas with the 2nd Battalion Worcesters who were stationed at Jhansi, India. On the 8th February 1913 the Battalion entrained in two special troop trains at Jhansi and proceeded via Agra and Delhi to Karachi for embarkation, arriving there on 11th February and embarked per H.T. Rewa the same day, sailing for Southampton on 12th February 1913 arriving at the latter place on the morning of the 4th March and disembarked on the 5th March after an absence on foreign service of 17 years and 4 months. On arrival at Aldershot the Battalion was quartered in Corunna Barracks. The Battalion settled down to hard work at Aldershot in the 5th Brigade as part of the 2nd Division. It was widely known that the European situation was dangerous and all ranks were perfected in their training for war. The order for mobilization was received at Aldershot in the evening of August 4th 1914, and during the ensuing week all ranks of the 2nd Worcestershire were busily employed in completing their preparations for War. Early on the morning of August 13th CQMS Pandfield with the rest of the 2nd Battalion marched down to the Government siding at Aldershot and entrained. The two trains which carried the Battalion left Aldershot at 0700 and 0800hours respectively and three hours later arrived at Southampton Docks. The two half-battalions were embarked on board the transports “Lake Michigan” and “Herschel.” All the rest of that day the ships lay in Southampton Docks. Not until after nightfall did the first of the two transports sheer off and steam down the quiet Southampton Water 6. For gallantry and ability during the advance through a very difficult country under heavy fire. Rendered valuable assistance to Company Commander. He was appointed CSM on the 1st October 1914 8. Wounded in action at Richebourg 16th May 1915 , he was admitted to 11 Stationary Hospital, Rouen on the 8th May 1915 with gun shot wound to his leg. Transported to England per H S St. Andrew on the 19th May 1915 8. He was admitted to 2nd Southern General Hospital, Bristol on the 21st May 1915 9 and the following day admitted to the 2nd Western General Hospital Manchester 10.William re-embarked on the 2nd October 1915. returning to the Battalion on the 6th October 1915 8. For service in the field he was promoted to 2 Lieutenant on the 18th December 1915, list 62 issued with Army Routine Orders 25th December 1915 (London Gazette 10th January 1916) 8. William Godridge Pandfield was a highly thought of soldier as the following extract from the diary of Captain C.H. Pigg, O.B.E., M.C. shows. After breakfast the platoons fell in for inspection. Near me that fine old soldier, Second Lieutenant W.G. Pandfield, D.C.M., was inspecting the remnants of his platoon. As Company Sergeant-Major of ‘A’ Company he had helped me wholeheartedly in the previous October; sometime after I joined he had left for home to train for a commission 11. On the 21st August 1916. 2 Lieutenant Pandfield was killed in action near Longueval 12. The following extract from 2nd Battalions War Diary for 21st August. Relief orders came in during the morning but were cancelled soon afterwards and we received orders for a small attack in conjunction with the Glasgow Highlanders on the German Line, which an aeroplane had reported to have been considerably strengthened during the previous night. The Glasgow Highlanders attacked but did not take the trenches. Our attack did not develop as there was such a short time in which to organize it. In his will he left effects of £308 11s 1p to his mother, Betsy Pandfield, widow of 83 Dolphin Road, Sparkhill, Birmingham (Administration Birmingham 8 December) 13. He has been conspicuous for his continuous gallantry and good work at all times. He manifested his devotion to duty when, the route being shelled, he patrolled telephone wires and maintained communication from a forward outpost to the battery continuously, thus enabling the fire of his battery to be directed without break 15. Pte.34028 Wyndham Stuart Pandfield, served with the Wiltshire Regiment and was entitled to the British War and Victory medals 3. Both brothers survived the conflict. Christopher Evans enlisted 31. 3. 1900). 5. South Africa Medal Roll entries. 6. The Worcestershire Regiment in the Great War by Captain H. FitzM. Stacke, M.C. 7. London Gazette 1st January 1915. 8. Record of Officers Service 2nd Battalion 1914 – 18 (Regimental archives, Worcester). 13. The national probate calendar. 14. Army service papers and MIC’s on Ancestry. Sister Florence married Edward Osmond Sweeney, Birmingham, June Q. 1904 (1901 census she was a servant in the household of Mr. and Mrs. Bosley , 20 Congreve Street, Birmingham). Regiment. Royal Welsh Fusiliers, Private. Served in Palestine. Parents, Alfred (labourer) and Fanny Spragg. Lived 1911 at ?? Regiment. Welsh Regt, Private. Served in France. Regiment. Worcester Yeomanry 2452 260400, Private. Served in France wounded once and mentioned in despatches. Parents, Alfred (labourer) and Fanny Spragg. Lived 1911 at Grey Haye. Regiment. 10th Bn. 2nd Worcesters, Private. Served in France and killed in action on 24/10/1916. Grave/Memorial ref B 77. Stump Road Cemetery, Grandcourt. Parents, Henry (labourer) and Mary Jane Spragg. Lived 1911 at Stone Hill. ref X1.H.1. Vlamertinghe New Military Cemetery. Parents, Thomas (Provisions Dealer) and Kate Louise Stallard. Lived 1911? Regiment. Royal Fusiliers, Private. Served in France and wounded twice. ​Stallard. Lived 1911 at Woodland Cottage. Parents, Edward (Carrier) and Minnie Taylor. Regiment. 173rd Canadian Highlanders, Private. Served in France and wounded once. ​Parents, Fanny Underwood (single) lived with her parents John and Elizabeth Underwood. Lived 1891 at 1 Frog Pool. Regiment. 2nd Worcesters, Signaller. Served in France, wounded once. On 19th February 1917 aged 18 enlisted in the Worcestershire Regiment at Worcester giving his trade as a bricklayers labourer. He served at home from 19th February 1917 until 17th december 1917. He then served in France from the 18th December 1917 until 9th May 1918 being posted to the 2nd Battalion on 13th January 1918. He returned to England on the 10th May 1918 and after 2 years service with colours was demobilized on 17th February 1919 being transferred to class Z Army Reserve. Private 45255 Walker was entitled to the British War and Victory Medals. Baptised 14th August 1898. Married Elsie A Powick on June 3rd 1922. Parents, William (Mason/ Bricklayer) and Mary Walker. Lived 1911 at The White House. Regiment. Royal Navy, H.M.S. Iron Duke, Able Seaman. Served in the Jutland Battle. Lived 1901 at. After the war worked for George Walker and Vales builders. Regiment. 1st Worcesters Yeomanry, Sergeant Major. Wounded once, died as a prisoner in Turkey on 16/11/1916. Grave/Memorial ref 180. Baghdad (North Gate) War Cemetery. Lived 1901 at Dod Oak House, Little Witley, born in Southsea. Regiment. RGA, Gunner. Served in France, wounded once. Regiment. Royal Garrison Artillery. Gunner. Regiment. Army Service Corps. Private. Parents, Thomas (Labourer) and Mary Barker. In 1871 they lived in Cart House and 1901 still at Cart House but James was not living there. Regiment. 8th Worcesters, Served in France. In 1911 census, he was 32, married and lived at Frogpool. He was a coachman/domestic and he and his wife Maggie both were both born in Cumberland and they had 1 son, Stanley aged 6. Regiment. 8th Worcesters. Private. Served at HW Frontier. Regiment. Australian Imperial, Chaplin of the Forces. Reverend Boultbee came to Shrawley to become its Rector in 1919 having stood in for Reverend J. Brien Frith whilst he was ill. He and his family left Shrawley sometime before 1928. Regiment. 5th Gloucesters. Private Served in France, wounded twice. Parents, Joseph (Farm Haulier) and Annie Brooks. In 1911 they lived in Horn Cottage. Regiment. R Army Service Corps - CIMT. Private. Served in France, prisoner in Germany. Regiment. 2/8 Worcesters. Private Served in France, prisoner in Germany. Parents, J Thomas (Sawyer) and Mary Bunce. In 1891 they lived in Slade Hole, up Slade Lane and in 1901 they lived at Baxters Green. Royal Navy, HMS Courageous, Stoker, Served in the battle of Heligoland. Regiment. 1st Lifeguards, Trooper, Served in France. Regiment. 1/7th Worcesters. Private Served in France/Salonika/Russia, wounded once. He was a boarder with Harry Brooks, Nr The New Inn. Regiment. North Staffs. Lance Corporal Served in France mentioned in Despatches. Parents, Thomas (farm labourer) and Fanny Cuff. In 1911 they lived at 1 Old Crown Cottages. Regiment. RASC, Private, Served in France. Regiment. 11th Worcesters, Private. Served in France and Salonika. Parents, Thomas Edwin and Elizabeth Crane, (Publican). Parents William, (painter and glazier), and Elizabeth Gegg. They moved to Shrawley between 1880 and 1891. Lived in 1901 at Upper Fuggers. William (son) worked as a gardener/domestic. Regiment. RGA, Gunner. Served in France. Parents, William, (painter and glazier), and Elizabeth Gegg. They moved to Shrawley between 1880 and 1891. Lived 1901 at Upper Fuggers. Regiment. Ox and Bucks light Infantry, Sergeant. Regiment. Shropshire Light Infantry, Private. Served in France, wounded once. Grand Parents?, William, (painter and glazier), and Elizabeth Gegg. They moved to Shrawley between 1880 and 1891. ​Lived 1901 at Upper Fuggers.?? ​Regiment. Somerset Light Infantry, Private. Served in France and Egypt. ​Regiment. Highland Light Infantry, Sergeant. Served in France, wounded once. Baptised/DOB 1897? in January 1922 he married Ruth Helen Jones. Parents, Andrew (farmer) and Jane Griffiths. Lived 1911 at The Knapp. Regiment. 17th Bn. Worcestershires, Sec. Rgt, Labour Corps, Private, trans. to (403040) 190th Prisoners of War Coy. Died 30/01/1919 in a Military hospital in Calais. Grave/Memorial ref VII.A.8A Les Baraques Military Cem. Sangatte. Parents, Samuel (Waggoner) and Ellen Grosvenor. Lived 1911 at Holders Cottages. Regiment.1st Bn. Worcestershires, Private. Killed in action 4/03/1917 in France. Grave/Memorial ref Pier & Face 5A and 6C. Thiepval Memorial. Parents, Samuel (Waggoner) and Ellen Grosvenor. Lived 1911 at Holders Cottages. Regiment. Army Veterinary Corps, Private. Died in action 8/08/1915 believed drowned. Grave/Memorial ref104. III. Leamington (Whitnash Road) Cemetery. Parents, William George, (Labourer/Roadman) and Rosa Hall. Lived 1891 near the Church, in 1901/11 family lived at 4 Old Crown Cottages. Regiment.15th Royal Warwicks, Private. Served in France and Italy, wounded twice. ​Regiment. 1st/8th Bn. Worcesters, Private. Died in action 20/04/1917. Grave/Memorial ref P.I.H.9B St Sever Cemetery extension, Rouen. Parents, Alfred, (Rabbit & Vermin catcher) and ?? Hinett. Lived in 1901 at Tibber - Ditch. ​Regiment. RGA, Gunner. Served in France, wounded once. Parents, Ann Jauncey (dressmaker) widow. Lived 1911 in Woodbine Cottages. ​Regiment. 1st Worcesters Yeomanry. Served in Mesopotamia. ​Regiment. Royal Army Medical Corps, Private. Served in France. ​Regiment. 1st Bn. 7th Worcesters. Served in France, wounded once. ​Regiment. 1st Bn. Somerset Light Infantry, Private. Served in France, killed in action on 29th March 1918 aged 20. Grave/Memorial ref Bay 4 Arras Memorial. He is also commemorated on the Gt War 1914-1918 plaque inside St Mary’s Church, Shrawley. Parents, Daniel Arthur (Farmer) and Rosemary Mary Neems. Lived 1901/11 at Church Farm. ​Regiment. Australian Expeditionary Force, RASC, Lieut. Served in Galiopoli, wounded once. DOB 1894? He left to go to Australia in December 1912. ​Regiment. 2nd Bn 8th Worcesters & R.A.F., Lieut. Served in Salonika. ​Regiment. 11th Worcesters, Private. Served in France and Salonika. Parents, John (labourer) and Sophia. Lived 1881 at 31 Old Crown1891 at 37 Carthouses. In June 1926 he emigrated to Canada and died just after disembarking at Quebec. ​Regiment. 1st Bn. 8th Worcesters, Private. Served in France and Italy, wounded once and mentioned in Despatches. Parents, Edward (labourer) and Susannah Powick. Lived 1911 at Kings Hill. Regiment. Royal Army Medical Corps, Private. Parents, Edward (labourer) and Susannah Powick. Lived 1891 at 57 Post Office. ​Regiment. Royal Navy HMS Diadem, Seaman. Died of pneumonia in service on 16/01/1916 and was brought back to Shrawley. St Mary’s Churchyard. Parents, Edward (labourer) and Susannah Powick. Lived 1901 at 57 Post Office and in 1911 at Kings Hill??. ​Regiment. RGA, Acting Bombardier. Wounded once, died in Flanders 16/01/1916. Grave/Memorial ref II.H.8. Maroc British Cemetery, Grenay. Parents, William Henry (Mason/ Bricklayer) and Mary Rowley. Lived 1901/11 at The Knowle. Regiment. RGA, Gunner. Wounded once, died in France 24/09/1917. Grave/Memorial ref VII.A.3. The Huts Cemetery. Regiment. West Yorks and RAF. Served in France. Parents, William Henry (Mason/ Bricklayer) and Mary Rowley. Lived 1901/11 at The Knowle. Regiment. 3rd Bn. 2nd Worcesters, Private. France killed in action 16/06/1915 Grave/Memorial ref Panel 34. Ypres (Menin Gate) Memorial. Lived 1911 at Mill Cottage. Regiment. Shropshire Light Infantry, RFA, Gunner. Served in France. Parents, Frank (Gamekeeper) mother not mentioned on 1911 census. Lived 1911 at The Lodge. Royal Navy, H.M.S. Abourkir, Able Seaman. Killed in action 22/09/1914. Grave/Memorial ref 3. Chatham Naval Memorial. Parents, Thomas (Provisions Dealer) and Kate Louise Stallard. ​Lived 1901 near the New Inn. Baptised 12th February 1892. Married Arthur Tom Cope in January 1920. Lived 1911 at Nutt Cross. Regiment. RFA, Gunner. Served in France, Salonika and Russia. ​Parents, William (Mason) and Mary Walker. Lived 1901 at White House. Regiment. Royal Sussex, Private. Served in North Russia. ​Lived 1911 at Believed to be a chauffeur at the Wood House. Regiment. RGA, Gunner. Served in France and was attacked by gas. Parents, William and Sophie Weavers. ​Lived 1901 at Hartlebury, Harold was living at Church Farm when he enlisted. Parents, John (market gardener) and Ann Westwood. Lived 1901/11 at Brant House. Parents, William and Caroline Wilcox. Lived 1901 at 63 Hillside, Martley. Regiment. Trench Mortar Battery & 3rd Worcesters, Sergeant. Served in France and wounded once. Parents, Richard H and Ellen J Williams. Lived 1901/11 at Shot Grove. He was born in Upper Sapey. Regiment. 2/8th Worcesters, Corporal. Served in France and wounded once. Lived 1901/11 at Shot Grove. War Memorials. On Thursday there was a most interestIng and impressive ceremony at the unveiling and dedicating of the War Memorials to those who fell in the great war. At 4.30 Brigadier General J. A. Gibbon, R.E., of the Southern Command, arrived at the church gate where he was met by a guard honour consisting of the members of the Shrawley Post of the Comrades of the Great War under the command of their Captain, Lieut. H. O. S. Pilkington, R.A.F. The first part of the service, which was conducted by the Rector (Rev. H. T. Boultbee), was taken from the base of the old Churchyard Cross, round which were grouped the school children, with the headmaster, Mr, Thomas, the choir being just outside tho Church porch. After the opening sentences, Psalm 121 was sung, and General Gibbon read the lesson from Rev. 21, 1-7. Then came a hymn "The Supreme Sacrifice," set to music by Mrs Belaribi, of Shrawley, during which a collection was taken for the memorial funds, followed by prayer. Then an impressive little ceremony followed, the Comrades placing a wreath on the grave of Seaman James Powick who died on service. A procession was then formed headed by the choir with processional cross, the Comrades, school children, relatives of the fallen and the congregation who marched, singing the hymn "Saviour, Blessed Saviour," round the road to the wayside cross which stands below the Church, on the main Worcester and Stourport road. 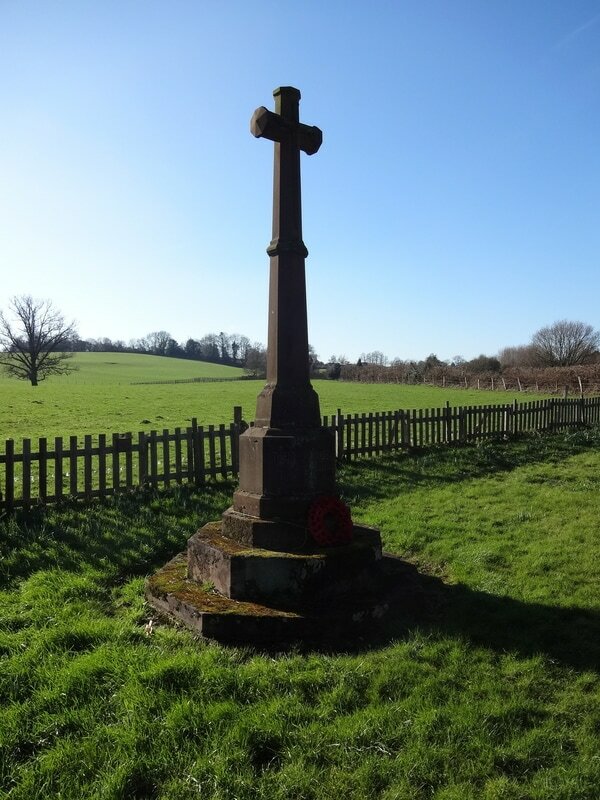 Here another hymn was sung, and after a prayer, the cross was unveiled by General Gibbon, and dedicated "To the honour and glory of God, and in proud memory of those whose lives were given in the service of their King and country." Many beautiful wreaths were then handed in, the first being from the Commrades of the Fallen. An inspiring address followed. General Gibbon, speaking on the words, "Lest we forget," impressed upon the large congregation grouped round him, the purpose of such a memorial. A bugler from the Norton Barracks then played the "Last Post." The procession reformed and marched back to the Church, where a tablet inscribed with the names of the 17 men who fell in the war was similarly dedicated and the service concluded outside on a triumphant note with the singing of "Jesus Lives," prayers, and the sounding of Reveille. It was a beautiful afternoon still and sunny, and the large gathering from tho parish and neighbourhood were deeply impressed by the solemnity of the service, which will live long in the memory of all.